It has been almost twenty five years since Il Cenacolo opened its doors, in 1988. I still can recall the excited phone call from a friend that prompted my first visit to the restaurant. Tom Aposporos, then mayor of Poughkeepsie and no slouch in the dining out department, called and insisted that we go for dinner. I was writing the Dining Out column for the Poughkeepsie Journal at the time, and the phone lines were already buzzing about this great new place in Newburgh. It’s hard to believe now, but in the Hudson Valley in 1988 Italian dining still meant spaghetti and meatballs and veal parmigiana. If you wanted “Rustic” or “Northern Italian” (what we called anything without red sauce back then), you went to New York to dine at Da Silvano, or later in the early 80’s to Il Mulino. There was no Aroma Osteria, no Mercato, or A Tavola. Mario Batali had not yet arrived on the scene; for that matter the TV Food Network was still five years away. The only thing we knew about Tuscany was Chianti – red wine in straw covered bottles that made great candle holders, and little else. And then along came Sali Hadzibrahimi, and Il Cenacolo. 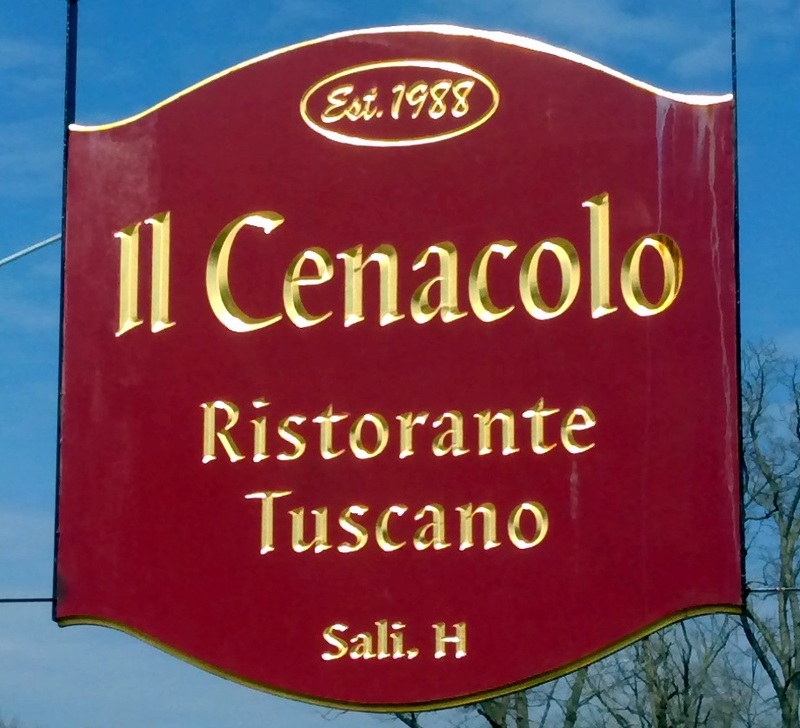 The Hudson Valley was introduced to authentic Cucina Tuscana and the rest, as they say, is history. If you are unfamiliar with Il Cenacolo you might be surprised by what you find when you pull into the parking lot. The restaurant is located in a building that looks like an abandoned foundation that someone decided to slap a roof on, with no actual building in the middle. It looks this way because that is exactly what it is. The inside looks a whole lot nicer than the outside. Just inside the entrance to the dining room Sali will have some of the evening’s appetizers on full display. The centerpiece is usually a whole prosciutto, ready for carving. Next to that you will typically find a wheel of Parmigiana Reggiano. Surrounding both will be platters of sliced marinated mushrooms, and slices of eggplant, tomatoes if in season, with buffalo mozzarella and basil, roasted peppers and different kinds of grilled squash, bowls of garbanzo and cannellini beans sit along side huge earthy slices of grilled portabellas. There is no reason to labor over selecting any one appetizer; just ask for a platter of everything for the table. You will want to share, and you will want a little taste of everything, without exception. 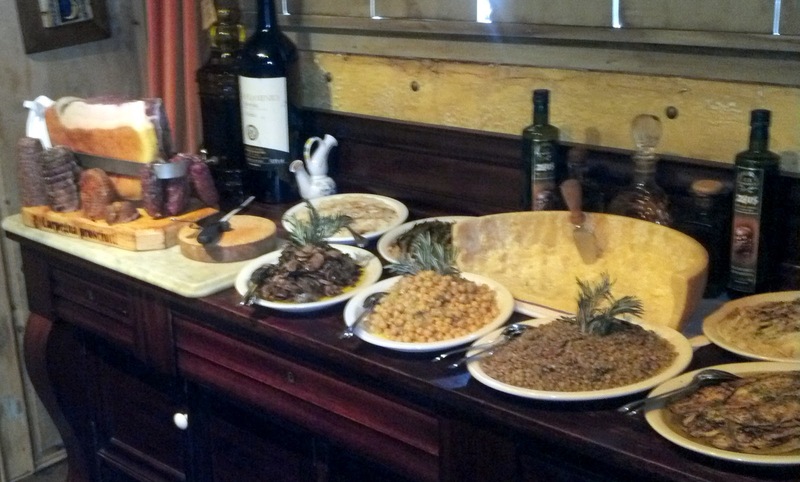 The entree menu will list dozens of classic dishes including the requisite selections of pastas and risottos. Do not settle on anything, because you will want to hear the “specials”. In the early years we marveled at the number of specials that were offered each day. What was more amazing was the fact that the waitstaff would recite them from memory, in exacting detail, including not just the method of preparation but the spices and sauces that accompanied each component of every dish. It really is quite the show. It took a while to realize – because there are so many specials – that they never change. I shouldn’t say they never change – some are seasonal – but for the most part the two dozen daily “specials” are all part of the regular menu. I don’t say this as a criticism; it makes for a wonderful presentation, especially for newcomers. It is culinary theater at its best, but the best is yet to come – that would be your meal. The specials will include some seasonal fish, swordfish and tuna make frequent appearances. Broiled with just a spritz of lemon is my favorite preparation. Simple. Classic. Another favorite is sweetbreads. I tried them again last week when I stopped in for lunch. Crisply sauteed, but leaving a perfectly creamy center. I rarely can pass on Sali’s sweetbreads. I ask for a small appetizer portion if I’m having something else for my entree. Another classic rustic dish, almost always offered as one of the daily “specials” is a sliced roast veal shoulder. This is Cucina Rustica at its best, a process which takes less expensive cuts of meat and slow cooks them until they are savory, succulent, and tender. This dish was the first dish that I had here in 1988 or 1989. This dish was also included in a meal that I had at Il Cencolo some years later with a bottle of 1990 Antinori Tignanello. That wine was the best wine that I had ever tasted. The Antinori’s had just introduced the cabernet sauvignon grape to the Chianti region. Sacrilege! I also count that meal as one of the ten best meals that I have had in my life. Anywhere. So there you have it. There are lots of reasons to dine at Il Cenacolo, starting of course with the kitchen, which is extraordinary. There is quite a bit of Hudson Valley culinary history here too, and for many of us, lots of delicious memories. If you are a fan of rustic Italian cooking, we are now blessed with dining choices that we could only dream about twenty years ago, but this is where it all started. Back then I had awarded five stars in the Journal’s Dining Out column to a total of four restaurants: Harrald’s in Stormville, John Novi’s Depuy Canal House in High Falls, Rene’s in Catskill, and Il Cenacolo. Thankfully Cena is still with us. It was then, and still is, a Hudson Valley Top Ten Pick. Enjoy it.